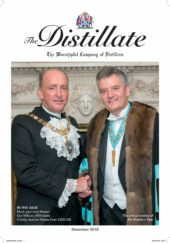 The Livery’s second Distillers’ Charity Auction takes place at Mercers’ Hall in the heart of the City of London on Tuesday 10 April 2018. Hosted by David Elswood, international auctioneer from Christie’s, the auction will include some of the rarest and most collectable whiskies in the world. With spectacular, unique, lots on offer, many donated by Livery members, the auction is hoped to generate significant interest from buyers and collectors around the world. All proceeds go to alcohol-related education, training of trade personnel and The Lord Mayor’s and City-related charities.